Books on Ancient Rome usually focus on its political, literary, military and economic aspects. They discuss the wars fought to protect and enlarge the State, the transition from monarchy to republic to empire and how all these different institutions functioned, the commercial relationships the ancient Romans had with other people and how they helped their civilization prosper, and how great writers such as Seneca and Cicero interpreted and influenced the society they lived in. Which is all very interesting, but also limiting. After all, there’s more to history than dates, battles and names. 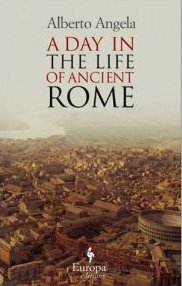 If like me, you’re more interested in the day to day life of a people, then A Day In The Life Of Ancient Rome, by Italian TV documentary host Alberto Angela, is a book you just can’t miss. It is more of a novel than a history book. Angela imagines he’s walking through the streets of Rome in 115 AD, during the reign of the Emperor Trajan, giving us an unique glimpse into the daily life of the Ancient Romans from dawn to dusk. He takes us into the homes of the Romans, showing us how both the poor and the rich lived, to the law courts where disputes were settled and lawyers would stop passers-by looking for potential clients, and to the thermae, where people relaxed, socialised and did business. He tells us how the ancient Romans dressed, what, where and how they ate (not always lying down), what toys children played with, what their shops were like, and what religion and cults they followed. But he also discusses the cruel and gruesome aspects of their daily life. We learn of how slaves were treated worse than animals, of the bloody games played in the Colosseum and other arenas where many gladiators found their deaths to entertain the people, and what the life of a prostitute was like. We all know how the ancient Romans shaped and influenced our modern society, but I hadn’t realised before reading this book how the most pressing everyday problems are still the same today as they were in 115 AD. Just like today, Ancient Rome, too, was very chaotic and expensive. Traffic congestion, difficulty in finding a place to live in the city, the dirt and garbage in the streets, the perils of walking alone at night, mass immigration are all problems that still plague the Italian capital today and are far from being solved.. Overall, this is a wonderful book for lovers of history and novices alike. The book is broken down by hours describing what the Romans did at a particularly time of the day in a brief and simple way that’s never boring. If you are an expert on Ancient Rome then this book won’t tell you much you already don’t know, but everyone else will be left wanting to know more details. But in any case, it will give modern readers a very good understanding of what life in Ancient Rome was like. A Day In The Life Of Ancient Rome by Alberto Angela is a wonderful book full of details and information on how the Ancient Romans lived. The book explores every aspect of daily life such as fashion, architecture, religion, food, family life, games, prostitution and slavery. The writing style is simple and engaging. This is a nice novel that will leave you wanting more, not a boring history book.